Abstract: As we increasingly depend on satellite technology in our everyday lives, understanding space weather is of critical importance to our national interests. Magnetic storms in the Earth’s space environment often occur following periods of intense solar activity. Some, but not all, of these storms are accompanied by a rapid enhancement in the population of very energetic electrons that travel at near-relativistic speeds. These so-called “killer electrons” are of particular interest to the space science community because of their potential threat to spacecraft instrumentation. Recent work has indicated that the mechanism for the production of these relativistic electrons is likely to be associated with pulsations in the Earth’s magnetic field at ultra low frequencies (ULF). In this study, the dynamic power spectra of ULF waves over a frequency range that encompasses three classes (Pc3, Pc4, and Pc5) of these waves are examined for two major magnetic storms: one with, and the other without, relativistic electron enhancement. 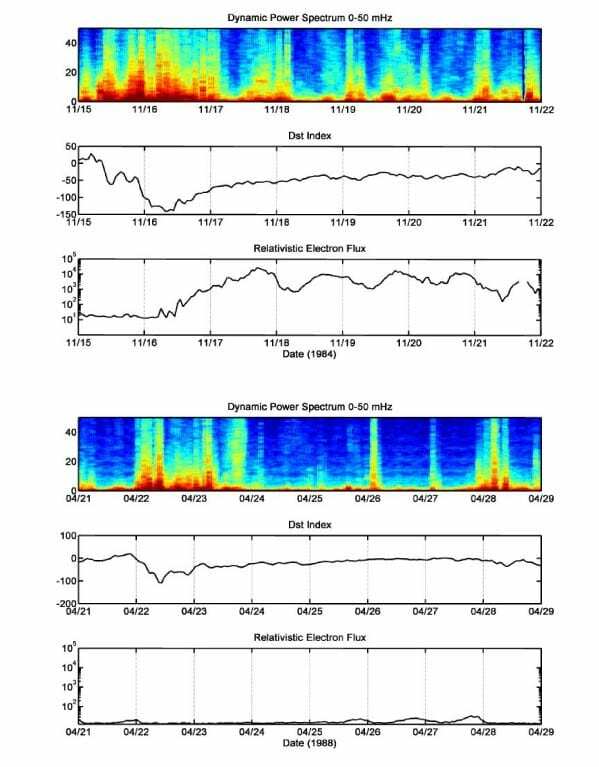 The ULF fingerprint of the storm that is accompanied by the energetic electrons exhibits a significant and prolonged increase in wave power during the storm’s recovery phase over a frequency range that encompasses all three wave classes. Alternately, the fingerprint of the storm without the energetic electrons shows an increase in wave power only for the lowest frequency waves in the Pc5 band. This difference indicates that a prolonged, broadband enhancement in wave power may be necessary for the production of killer electrons. This project was presented by the students at the Posters on the Hill Conference in Washington DC in April 2008. The project is funded by NSF. Image caption (above): Two magnetic storms, one with, and one without an increase in the energetic electron population.